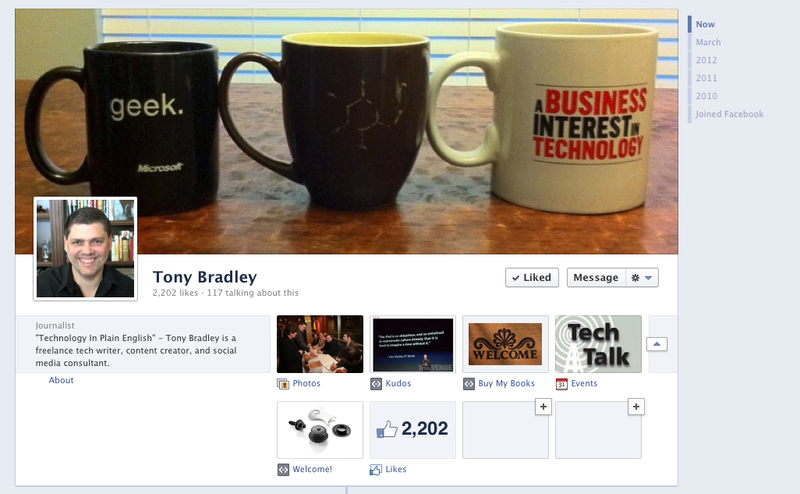 Facebook recently rolled out the new Timeline layout for business pages. The launch of Timeline came with a small hiccup, though, as images have been randomly replaced for some users. What’s more concerning is the fact that the images that were inserted don’t actually belong to the owner of the Facebook page. I know because it’s happened to me. Twice. Facebook just pushed the Timeline out to the entire social network, but I jumped on board and published my Facebook Page using the Timeline layout as soon as it was available at the beginning of March. I added a Cover photo, and went through the process of customizing the linked tiles below the Cover photo to replace the default “iFrame” image with my own pictures. The image above "Buy My Books" and "Welcome" are not the ones I assigned. They're not even mine. Fast-forward a week or two. I logged in to Facebook one day to find that one of my images had been replaced, and I had absolutely no idea where the new picture came from. I could almost understand if some Facebook glitch randomly substituted one of my other images, but it seems like a security or privacy concern for Facebook to display someone else’s image on my Facebook Page. I decided at the time that it was just a fluke, so I went back into the settings and replaced the bizarre random images with my own pictures once again. But, a couple weeks later two of my images were again replaced by pictures that don’t belong to me, and the same thing happened to my wife’s Facebook Page for her business. Apparently, it wasn’t just a fluke. The images that appeared on my Facebook Timeline were unremarkable. They weren’t family vacation pictures, and didn’t really seem to be personal at all. It’s possible that the Timeline glitch scrambled the data on the Facebook server, and was simply serving up images from other Timelines. But, that’s just speculation. It’s possible that private pictures were somehow being shared out without permission as a result of this Timeline glitch. I brought the issue to the attention of Facebook. I was told that the product development team addressed the issue last week. A Facebook spokesperson explained that the bug pulled images from other Timeline app images, and not from personal profile photos. Facebook claims the issue had no impact on privacy or security. I have asked Facebook for further clarification of what happened, what was done to fix it, or what security and privacy concerns may have existed prior to the flaw being fixed. That response is still pending.